I suppose many (most?) of you already follow Orlov’s great blog and have already read this piece. As far as I’m concerned, it’s one of the very best analyses of the predicaments we face all wrapped up in a concise and easy to understand piece of journalism. Once upon a time—and a fairly long time it was—most of the thickly settled parts of the world had something called feudalism. It was a way of organizing society hierarchically. Typically, at the very top there was a sovereign (king, prince, emperor, pharaoh, along with some high priests). Below the sovereign were several ranks of noblemen, with hereditary titles. Below the noblemen were commoners, who likewise inherited their stations in life, be it by being bound to a piece of land upon which they toiled, or by being granted the right to engage in a certain type of production or trade, in case of craftsmen and merchants. Everybody was locked into position through permanent relationships of allegiance, tribute and customary duties: tribute and customary duties flowed up through the ranks, while favours, privileges and protection flowed down. It was a remarkably resilient, self-perpetuating system, based largely on the use of land and other renewable resources, all ultimately powered by sunlight. Wealth was primarily derived from land and the various uses of land. Here is a simplified org chart showing the pecking order of a medieval society. Feudalism was essentially a steady-state system. Population pressures were relieved primarily through emigration, war, pestilence and, failing all of the above, periodic famine. Wars of conquest sometimes opened up temporary new venues for economic growth, but since land and sunlight are finite, this amounted to a zero-sum game. But all of that changed when feudalism was replaced with capitalism. What made the change possible was the exploitation of nonrenewable resources, the most important of which was energy from burning fossilized hydrocarbons: first peat and coal, then oil and natural gas. Suddenly, productive capacity was decoupled from the availability of land and sunlight, and could be ramped up almost, but not quite, ad infinitum, simply by burning more hydrocarbons. Energy use, industry and population all started going up exponentially. A new system of economic relations was brought into being, based on money that could be generated at will, in the form of debt, which could be repaid with interest using the products of ever-increasing future production. Compared with the previous, steady-state system, the change amounted to a new assumption: that the future will always be bigger and richer—rich enough to afford to pay back both principal and interest. With this new, capitalistic arrangement, the old, feudal relationships and customs fell into disuse, replaced by a new system in which the ever-richer owners of capital squared off against increasingly dispossessed labour. The trade union movement and collective bargaining allowed labour to hold its own for a while, but eventually a number of factors, such as automation and globalization, undermined the labour movement, leaving the owners of capital with all the leverage they could want over a demoralized surplus population of former industrial workers. In the meantime, the owners of capital formed their own pseudo-aristocracy, but without the titles or the hereditary duties and privileges. Their new pecking order was predicated on just one thing: net worth. How many dollar signs people have next to their name is all that’s necessary to determine their position in society. But eventually almost all the good, local sources of hydrocarbon-based energy became depleted, and had to be replaced using lower-quality, more remote, harder-to-produce, more expensive ones. This took a big bite out of economic growth, because with each passing year more and more of it had to be plowed right back into producing the energy needed to simply sustain, never mind grow, the system. At the same time, industry produced a lot of unpleasant byproducts: environmental pollution and degradation, climate destabilization and other externalities. Eventually these started showing up as high insurance premiums and remediation costs for natural and man-made disasters, and these too put a damper on economic growth. Population growth has its penalties too. You see, bigger populations translate to bigger population centers, and research results show that the bigger the city, the higher is its energy use per capita. Unlike biological organisms, where the larger the animal, the slower is its metabolism, the intensity of activity needed to sustain a population center increases along with population. Observe that in big cities people talk faster, walk faster, and generally have to live more intensely and operate on a tighter schedule just to stay alive. All of this hectic activity takes energy away from constructing a bigger, richer future. Yes, the future may be ever more populous (for now) but the fastest-growing form of human settlement on the planet is the urban slum—lacking in social services, sanitation, rife with crime and generally unsafe. What all of this means is that growth is self-limiting. Next, observe that we have already reached these limits, and have in some cases gone far beyond them. 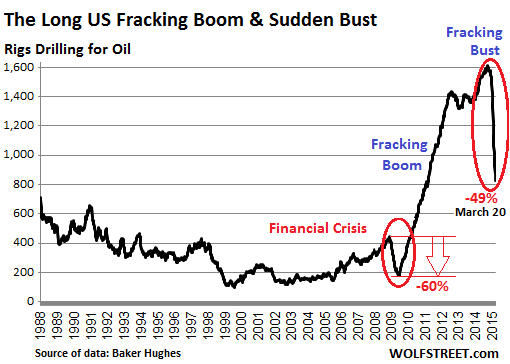 The currently failing fad of hydraulic fracturing of shale deposits and steaming oil out of tar sands is indicative of the advanced state of depletion of fossil fuel sources. Climate destabilization is producing ever more violent storms, ever more severe droughts (California now has just a year’s worth of water left) and is predicted to wipe out entire countries because of rising ocean levels, failing monsoon seasons and dwindling irrigation water from glacial melt. Pollution has likewise reached its limits in many areas: urban smog, be it in Paris, Beijing, Moscow or Teheran, has become so bad that industrial activities are being curtailed simply so that people can breathe. Radioactivity from the melted-down nuclear reactors at Fukushima in Japan is showing up in fish caught on the other side of the Pacific Ocean. All of these problems are causing a very strange thing to happen to money. In the previous, growth phase of capitalism, money was borrowed into existence in order to bring consumption forward and by so doing to stimulate economic growth. But a few years ago a threshold was reached in the US, which was at the time still the epicenter of global economic activity (since eclipsed by China), where a unit of new debt produced less than one unit of economic growth. This made borrowing from the future with interest no longer possible. Whereas before money was borrowed in order to produce growth, now it had to be borrowed, in ever-larger amounts, simply to prevent financial and industrial collapse. Consequently, interest rates on new debt were reduced all the way to zero, in something that came to be known as ZIRP, for Zero Interest Rate Policy. To make it even sweeter, central banks accepted the money they loaned out at 0% interest as deposits, which earned a tiny bit of interest, allowing banks to make a profit by doing absolutely nothing. glutUnsurprisingly, doing absolutely nothing proved to be rather ineffective, and around the world economies started to shrink. Many countries resorted to forging their statistics to paint a rosier picture, but one statistic that doesn’t lie is energy consumption. It is indicative of the overall level of economic activity, and it is down across the entire world. A glut of oil, and a much lower oil price, is what we are currently witnessing as a result. Another indicator that doesn’t lie is the Baltic Dry Index, which tracks the level of shipping activity, and it has plummeted too. And so ZIRP set the stage for the latest, most queer development: interest rates have started to go negative, both on loans and deposits. Good bye, ZIRP, hello, NIRP! Central banks around the world are starting to make loans at small negative rates of interest. That’s right, certain central banks now pay certain financial institutions to borrow money! In the meantime, interest rates on bank deposits have gone negative as well: keeping your money in the bank is now a privilege, for which one must pay. But interest rates are certainly not negative for everyone. Access to free money is a privilege, and those who are privileged are the bankers, and the industrialists they fund. Those who have to borrow to finance housing are less privileged; those who borrow to pay for education even less so. Those not privileged at all are those who are forced to buy food using credit cards, or take out payday loans to pay rent. The functions which borrowing once played in capitalist economies have been all but abandoned. Once upon a time, the idea was that access to capital could be obtained based on a good business plan, and that this allowed entrepreneurship to flourish and many new businesses to be formed. Since anybody, and not just the privileged, could take out a loan and start a business, this meant that economic success depended, at least to some extent, on merit. But now business formation has gone in reverse, with many more enterprises going out of business than are being formed, and social mobility has become largely a thing of the past. What is left is a rigidly stratified society, with privileges dispensed based on hereditary wealth: those at the top get paid to borrow, and get to surf on a wave of free money, while those at the bottom are driven ever further into debt servitude and destitution. Can NIRP underpin a new feudalism? It certainly cannot reverse the downward slide, because the factors that are putting limits on growth are not amenable to financial manipulation, being physical in nature. You see, no amount of free money can make new natural resources spring into existence. What it can do, however, is freeze the social hierarchy among the owners of capital—for a while, but not forever. Everywhere you care to look, the ever-shrinking economy eventually results in populist revolt, war and national bankruptcy, and these cause money to stop working in a number of ways. There is usually devaluation, bank failures, inability to finance imports, and the demise of pensions and of the public sector. The desire to survive causes people to focus on getting direct access to physical resources, distributing them among friends and family. A good, precise term for this state of affairs is “anarchy.” Once a new, low level of steady-state subsistence is reached, the process of aristocratic formation can begin anew. But unless a new source of cheap fossil fuels is somehow magically discovered, this process would have to proceed along the traditional, feudal lines. 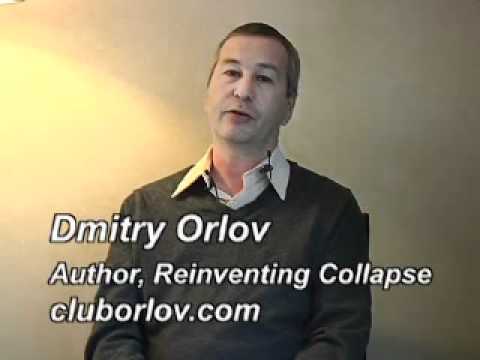 This another very good video about the crises of capitalism. But I find it amazing that Limits to Growth is left out of this. Limits to Growth will DESTROY Capitalism, and in the very near term to boot. This video’s maker purports, I presume, that he sees ‘the big picture’, when in fact he’s only seeing the money side of things. Great cartoons, often humorous, worth watching, but what do you think…? This great video questions our freedom, the education system, corporations, money, the American capitalist system, the US government, world collapse, the environment, climate change, genetically modified food, and our treatment of animals…. As the cost of everything seems to be plummeting right now, I, who always plays the devil’s advocate and sceptic of the first order, find it hard to not wonder if Nicole Foss’ much vaunted deflationary spiral is not already underway. Just this morning I found out that the US coal industry is in trouble. Then, reports of worsening problems are finally surfacing about the oil industry. As we all know here at DTM, without a profitable fossil fuel industry, absolutely nothing else will eventuate when it comes to the alternatives…….. so what to make of this? All I can say is, hang onto your hat, because the ride will be interesting. The US coal market is crashing in what analysts warn is a sign of things to come for other fossil fuel markets. At least 26 coal producers have gone bankrupt in the last three years, the Carbon Tracker Initiative think-tank found. Others including Peabody Energy, the world’s largest private coal company, have lost 80% of their share value. “Cheap gas has knocked coal off its feet, and the need to improve air quality and ever-lower renewables costs has kept coal down for the count,” said report co-author Luke Sussams. Meanwhile, demand growth from Asia has been slower than expected. China’s coal consumption fell 3% in 2014 as the country sought to tackle increasingly severe air pollution in its cities. Electric vehicles remain more expensive than combustion-engine equivalents, largely because of battery costs. In 2013 the International Energy Agency estimated cost-parity could be reached in 2020, with battery costs reaching $300* per kilowatt-hour of capacity. It says industry-wide costs have fallen from above $1000 per kilowatt-hour in 2007 down to around $410 in 2014, a 14% annual reduction (blue marks, below). Costs for market-leading firms have fallen by 8% per year, reaching $300 per kilowatt hour in 2014 (green marks). 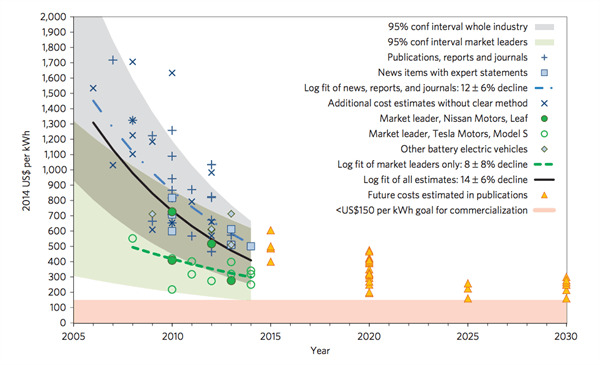 Figure 1: Cost estimates and future projections for EV battery packs, measured in $US per kilowatt hour of capacity. 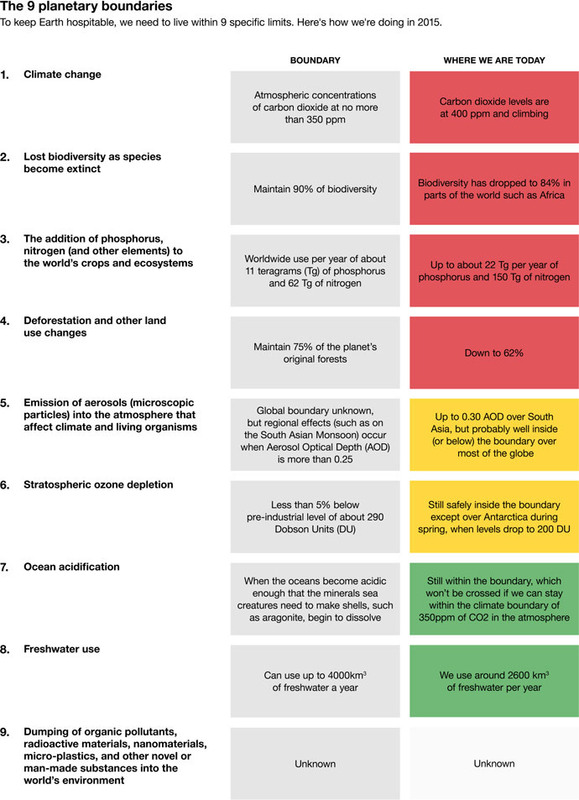 Each mark on the chart represents a documented estimate reviewed by the study. Source: Nykvist et al. (2015). The paper estimates prices will fall further to around $230 per kilowatt-hour in 2017-18, “on a par with the most optimistic future estimate among analysts”. The crossover point where electric cars become cheapest depends on electricity costs, vehicle taxes and prices at the pump. In the US, with current low oil prices, battery packs would need to fall below $250 per kilowatt-hour for electric cars to become competitive, the study says. Behavioural barriers to electric vehicle uptake present additional hurdles to widespread adoption. Overall it is “possible” that economies of scale will push costs down towards $200 kilowatt-hour “in the near future even without further cell chemistry improvements”, the paper concludes. If the paper is right then electric vehicle uptake could exceed expectations. That will be a good thing for the climate – just as long as the electricity that fuels them is not from coal. Whilst the entire planet has warmed over the last century, the Arctic has seen the greatest rises in temperatures. One of the most obvious symptoms of that change has been the changing patterns of sea ice movements covering the Arctic Ocean each winter. 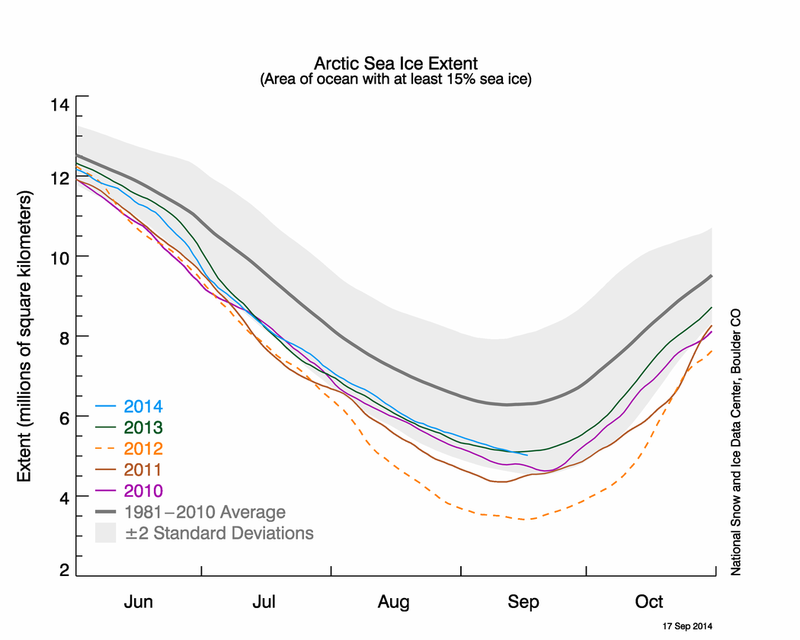 Although the extent of its summer time melt is variable from year to year, there has been an obvious sharp downward trend in the amount of Summer ice left each September, but, as the Arctic moves into 24 hour darkness through Winter, most of the ocean freezes over again and everyone concentrates on how low the Summer maximum coverage goes. This year though, unusual (but predicted) winter warmth at the edges of the sea ice has led to a most unusual refreeze, and a record low for the maximal ice extent has occurred…. This year’s maximum extent of ice coverage of 14.54 million square kilometres, was more than a million square kilometres below the long-term average. Usually, the peak of the refreeze happens in March, but this year, ice coverage started dropping in late February. Then it stabilised for two weeks. And that was that….. 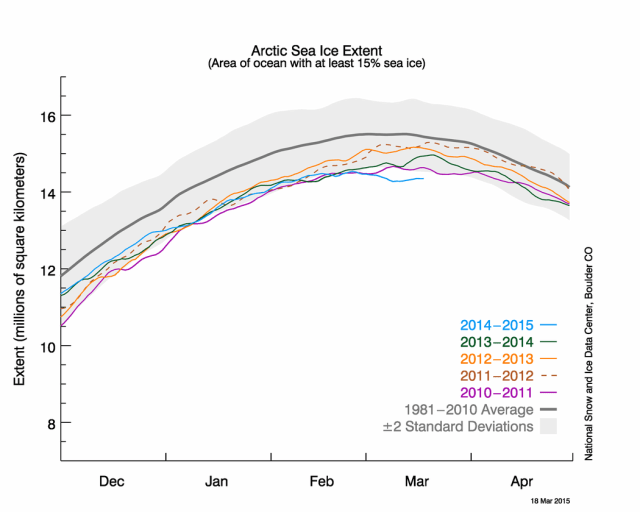 This change in behaviour took the cover area outside of two standard deviations of the 1980-2010 average ice extent. The NSIDC (National Snow and Ice Data Center) which monitors these things, tells us that there may be further freezing yet to occur, but unless that freeze is extreme, ice coverage is not likely to revert to where they were in February. But back to the Arctic…. Ice extent was lower there, in the Bering Sea, and in Russia’s Sea of Okhotsk. What does this mean for this summer’s melt? Who knows… All bets are off now as far as I’m concerned… If you compare the graph above to one of recent summer melts, you’ll see that in 2012, the summer that saw the greatest loss of ice, actually had a winter maximum that was late in the year and above average—the exact opposite of this winter. So if this Arctic heatwave continues, will we see the first ice free Summer sooner than anyone has predicted?